In this release of Stickyworld we have focused on improving tools mainly for organisers, and giving you more information and autonomy so you don't have to call on admin users to help you complete your room tasks, for instance downloading reports. Read on to understand the key new features that we hope make organiser workflow smoother than before. If you need any help, remember you can always chat with support under the help drop down or send an email to support (at) stickyworld.com. We have overhaued the Organiser view, added more information about the room and included action buttons for organisers so you no longer have to ask Admin user for help. Only the pages and tools relevant to organising rooms are presented, which we hope provides a more focused experience. There's a clear button in the top bar to switch the view back to a Participant's view, so you can see how this Room appears to your Participants. The button acts as a toggle so you can switch between the two views from any page in the room. 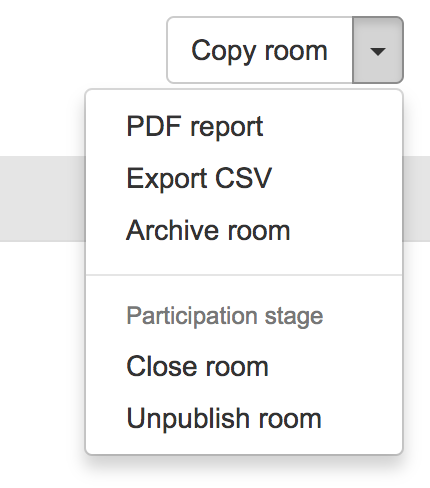 In the Organiser view, we have added an action dropdown button in the header to enable various room organiser functions, like copying and archiving the room, exporting data and generating reports, and also enabling change of room stage and unpublishing. We have introduced two new pages, a summary page and a results page. The summary page quickest way to get an overview of your Room. It records setup information, and also some engagement metrics. Think of it like the cover page of a report and you get to know what all is going on inside. This isn't all, you make changes from this page. Click on the edit link next to any row you want to modify and you can change and save right in your view. You can always switch to the settings page tab for more detailed control on the settings, and help tips. We have received multiple requests to introduce analytical results from the data our Organisers collect in a room. We have introduced the results page to house some of this, with four charts. The page is currently in beta and we are looking for feedback to enhance the experience, so don't hesistate to contact us. You can see graphical representations of comment/reply activity over time, comments per slide, replies per comment and most liked comments. Please check these out, and write via contact support about what you liked or didn't as we will be looking to invest more effort here in the coming months. 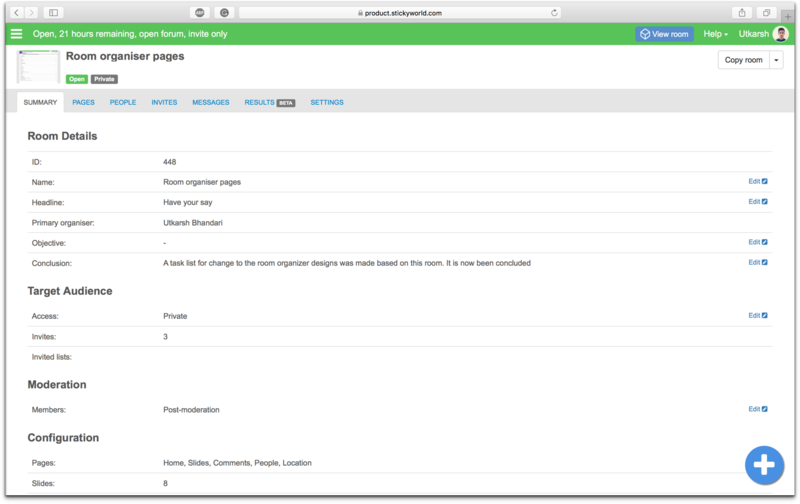 Customers consistently have asked us where to edit page names, so we've introduced a simpler "all-in-one" design to enable activation of the pages you need, edit names, change the order of pages, all in a single interface. Under the 'Pages' tab in the Organiser's view, you can find the improved interface for controlling what pages are visible to your participants. You can re-order them easily: hold from the lines on the left and drag and drop them to arrange to your liking. You turn them on and off from the checklist. You can customise the page name so that it best aligns with the engagement you are seeking. The description underneath explains what the function of the respective page is. Click on the "edit" link to make changes to the content of the page. Cleaner interface with Bootstrap 3. In this relase we've made the leap to 'Bootstrap 3' across the software, the mobile responsive UI library. This, which is means you'll see neater looking screens, flat buttons and we hope overall ease of use throughout. Bootstrap 3 also promises better responsiveness across devices. We hate bugs. As always, we found a few and squashed them. If you read this so far, please drop us a line on how you are liking this software update. If you haven't as yet completed our organiser survey, you can help shape future releases by clicking on the link below.